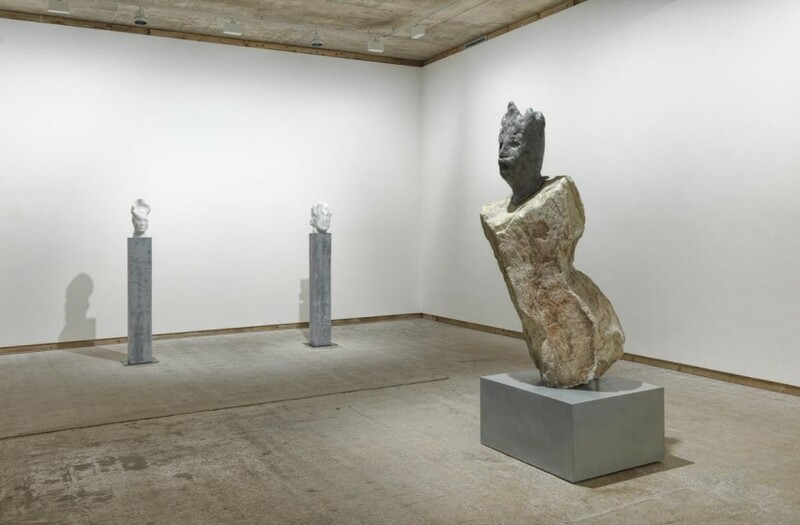 Daniel Silver, Rock Formations, installation view, Frith Street Gallery, 2015. All works courtesy the artisy and Frith Street Gallery, London. Photograph: Alex Delfanne. 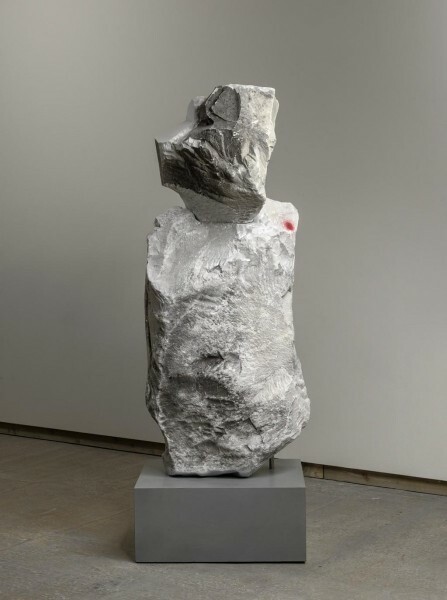 Daniel Silver, Untitled, 2014, from Rock Formations, Frith Street Gallery, 2015. All works courtesy the artisy and Frith Street Gallery, London. Photograph: Alex Delfanne. Let us start the year with a pair of must-see solo exhibitions that both opened last night. Danh Vō and approach the proposition of object making from very different angles, and viewed at such close proximity – at Marian Goodman Gallery and round the corner at Frith Street Gallery respectively – the common tactic of appropriating artefacts and materials serves most acutely to point up the differences between them, rather than similarities. The rough, unpolished concrete floors of Frith Street’s main space provide a pleasingly tough and uncompromising foil for Daniel Silver’s new body of work, and his first ever solo show with the gallery. Huge, weathered lumps of rock, recovered from oblivion in the historic stone yards of Pietrasanta, provide the ‘body’ for clay and stone carved heads, bearing crowns. Over two metres tall, these enigmatic monarchs take their vitality from the natural dynamism of the rock formations that belies everything you know about the inertia associated with several tons of rough-hewn stone. 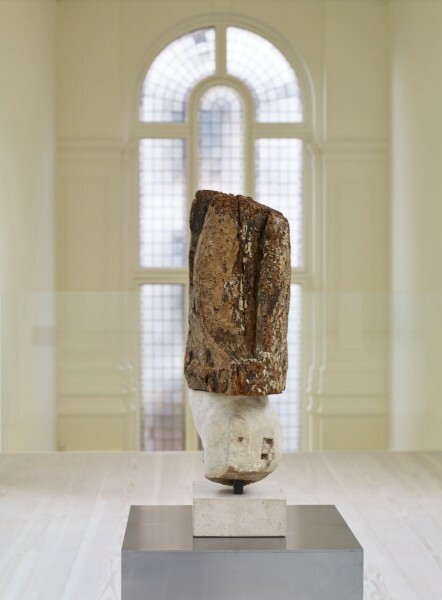 To one side of the gallery, on a row of slender concrete plinths, sit a series of marble heads. (The mode of display borrowed here for this type of material is an instantly familiar orthodoxy.) Silver has reworked marble copies of classical Greek sculpture and the effect is as if the passage of centuries has physically eroded the forms, or as if the action of looking by so many thousands of eyes has abraded the surfaces and rounded and softened every contour. 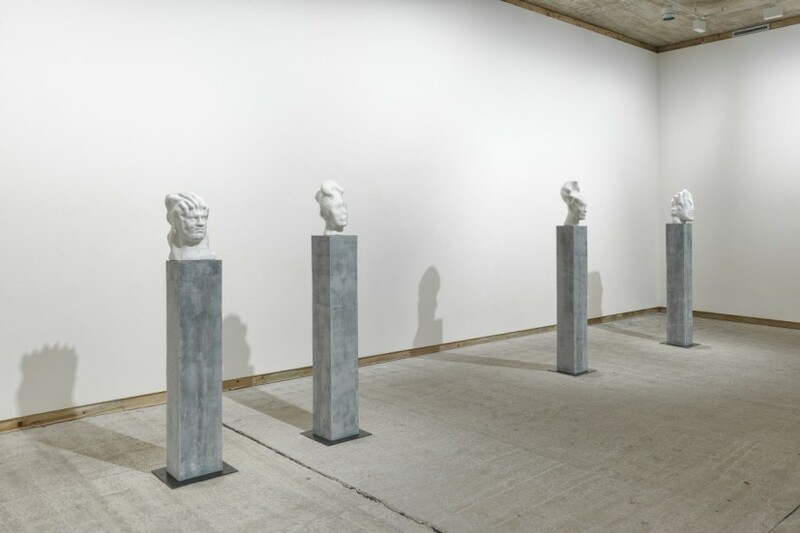 Each head is luminously white, the volumes of human physiognomy still recognisable, but abstracted to a point where the individuality of the subject – so far beyond the memory of anyone living – is entirely lost. 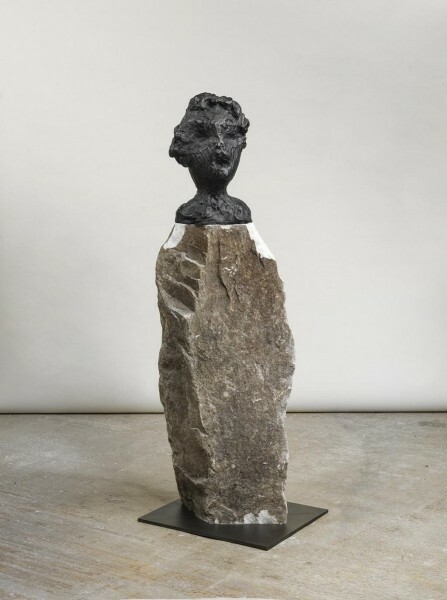 Geological time, as well as archaeological time is invoked, while histories of sculpture are rehearsed in the appropriation and ‘repurposing’ of copies from the antique. Danh Vō’s 2013 exhibition Mother Tongue at Marian Goodman in New York used artefacts from the estate of Robert McNamara, former US Secretary of Defence during the Vietnam War, and therefore kept close to the artist’s own biography. Chairs used by McNamara and President Kennedy, for example, were pulled apart in a very physical investigation of the minutiae of power relationships. Vō’s first solo show in London, Homosapiens seems to hint at a broader perspective on the human condition, and could be said to pivot on the newspaper announcement of the marriage of one George Bush to a Miss Barbara Pierce in 1945. The innocent notice holds within it – at this historical distance – the wry understanding of not one, but two men who would go on to be presidents of the US with incalculable geopolitical consequences. There was some controversy, we recall as well, around the facts of George W’s military record during the Vietnam War. Sculpture in this new exhibition uses 1st and 2nd century Roman marble sculpture as well as early gothic polychrome sculpture: a fragment of a statue of a child, a fluted marble column, a marble torso of Apollo – all are combined with rough timber or vintage boxes with proprietary logos (Johnny Walker whisky features) to create affecting, but melancholy hybrid entities. In the upper gallery the severely bisected oak head of a cherub (17th century) lies wedged into a timber box, with the slots in its shoulders the only signal of the wings that were once there. This is a show that has made much use of high-tech cutting tools on objects normally venerated for their age. 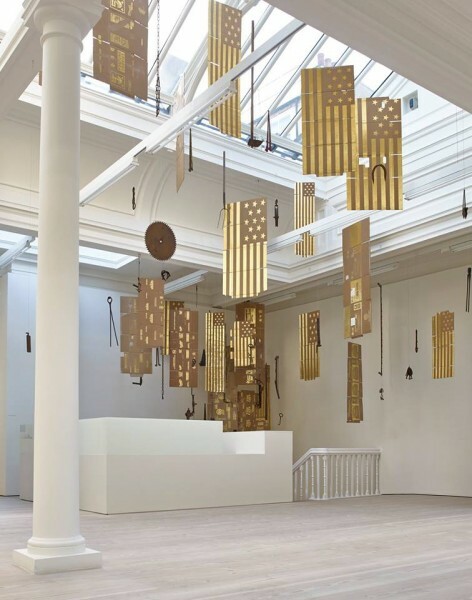 Over the stairwell is a work that combines the familiar gold-leafed cardboard boxes with numerous suspended metal implements: various rusted tools for which the agricultural purpose is long forgotten sit alongside objects that even the most metropolitan of 21st century viewers can identify as the savage animal traps of a less enlightened age. 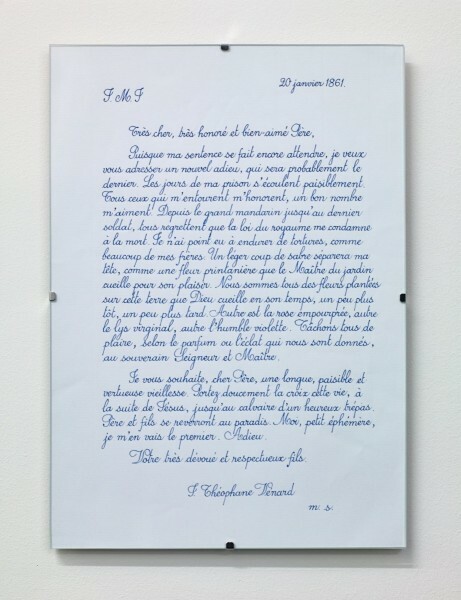 Text drawn by the artist’s father features again in the exhibition, this time a ghostly pencil outline of gothic script on the floor that quotes 19th century Saint Jean-Théophane Vénard from a letter to his father. Vénard is known as one of the Martyrs of Vietnam, executed there for his Christian missionary work in 1861. Collectors purchasing the work will receive a handwritten copy of the text in an envelope mailed by the artist’s father directly to the buyer. Loops of meaning weave the works in the show together like a single text, establishing histories of power and religion with a complexity that only seems to deepen upon examination. More than one visit probably required.